While you bounce around the home getting other things done, the smaller, lightweight base, is easy to move from room to room - allowing you to stay together and play together! A full-360° spinning seat allows your child to move from toy to toy, surrounded by an entire playground of fun. A variety of sounds, music and textures allow each play session to be full of new and different experiences, and 3 positions allow you adjust the height as your child grows. 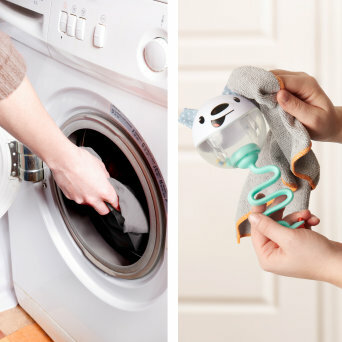 The item is easy to keep clean - wipe the removeable toys and throw the seat pad in the washing machine. No tools required for set up. 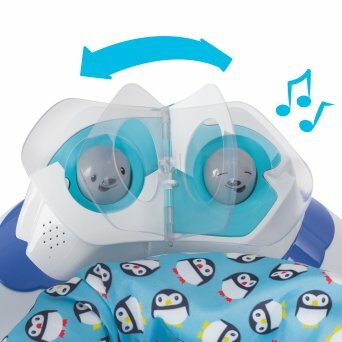 This makes a fantastic registry item, so you can be ready to pull it out of the closet as soon as your child is able to hold head and neck unassisted... it happens so quickly! Fit: For use with children who can hold up head and neck unassisted. Do not use for children who can walk. 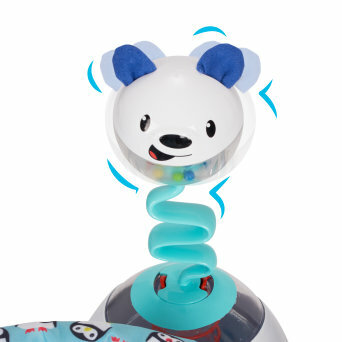 Whether your little one is flipping the pages, wobbling the polar pals, tipping the penguins or spinning the huskies, he or she will have a blast exploring the fun sounds and surprising movements. 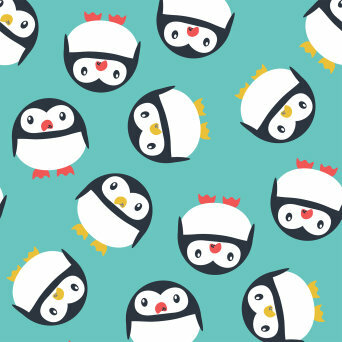 Your little one will develop fine motor skills, hand-eye coordination and core muscle control as they play with a collection of polar pals. 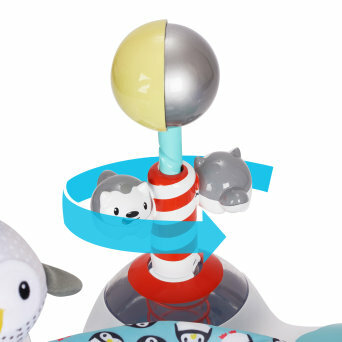 Each oversized toy has unique textures and fun sounds to catch and hold your child's interest. 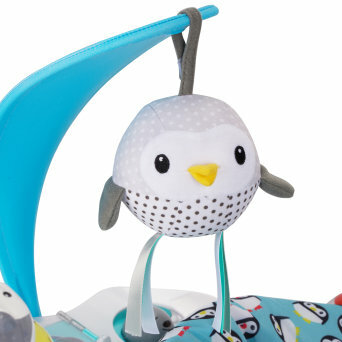 If your little one falls in love with "Snow Owl", it can be detached from the ExerSaucer and taken along throughout the day. This cuddly, crinkly toy is ultrasoft and makes the best cuddle companion. All toys and parts wipe clean with mild soap and water, while the seat pad is machine washable to make cleanup a breeze. 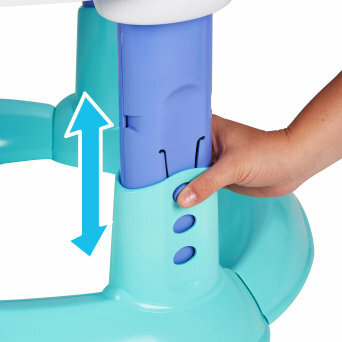 The three, easily adjustable height settings grow with your baby and accommodate longer use. The small frame and compact, lightweight base offer easy movement around your home or when traveling. Polar Playground Bouncing Activity Center is rated 4.4 out of 5 by 31. Rated 1 out of 5 by Boy Mom from Cute but the toys keep popping out. 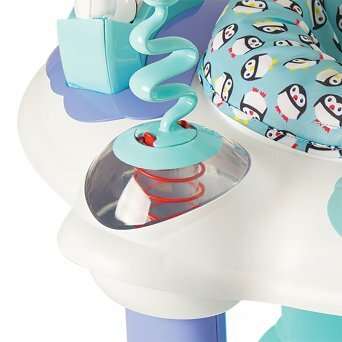 I purchased the Exersaucer Polar Playground a few months ago for my now 7 month old baby, and I am really frustrated with the product right now. My baby can push on the toys such that they fall out of the unit, leaving holes where there should be toys. I've double and triple checked that the toys are clicked in securely and he can get them out every time. I don't see other reveiwers dating this so I don't know if mine is defective or what, but without the toys this thing is a $100 paper weight. This is my 3rd Exersaucer purchase and the first one that this has happened with. Rated 5 out of 5 by Miller1980jc from Absolutely love it!! I've owned two other exersaucers before. This one far surpasses my expectations and my son absolutely loves it! He love so bejng able to touch the ground and not a hard plastic. The pieces keep him busy and entertained. We have more tears when we take him out! The pieces it self are sturdy and extremely well made. The colors are gorgeous! My son has a severe food allergy and can't touch anyone when they are eating so he plays next to us while his siblings eat and doesn't care! I love this product and would highly recommend it and the price it great compared to others! This is well worth the cost! Rated 5 out of 5 by heartadrift from Lightweight, Adorable, & Fun! 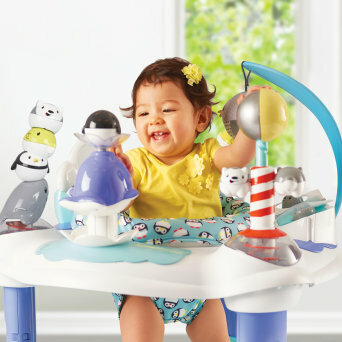 Overall, I am so pleased with the Polar Playground Activity Center ExerSaucer! 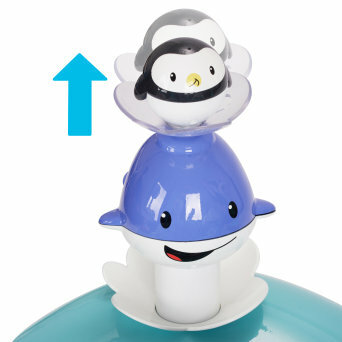 Not only is it really cute with the little whale and penguins, but its size is just perfect for tucking away into a corner or putting in the middle of the living room without it getting in the way. It is also incredibly lightweight, making it very easy to move from room to room or even carry upstairs when I need to get some laundry folded or do other things up there while my baby plays beside me. Initially, when I unboxed it, I was a little concerned about how long it would take me to assemble it. Out of curiosity, I started my stopwatch to see just how long it would ultimately take and it actually only took 22 minutes! Way faster than any other baby gear I've assembled! Another perk: the cloth seat itself is so easy to remove for cleaning! As far as my baby is concerned, he loves it too!! The activities truly do keep him entertained, and he can actually reach and grab them all, which is a HUGE plus! 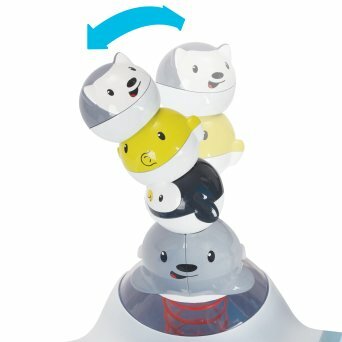 My older son had another activity center from a different company, and unfortunately he couldn't even reach all of the toys which usually left him feeling frustrated (and it frustrated me too because inevitably I would have to reach them for him). Last, but definitely not least, I love love LOVE the fact that the volume switch is located underneath the activity center. That prevents my toddler from cranking up the volume too loud for his baby brother, which makes this mommy very happy too! I would (and already have) recommend this to anyone in a heartbeat! 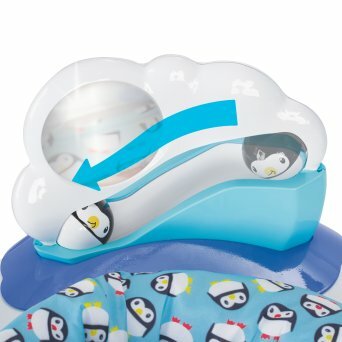 Rated 5 out of 5 by Lilysmommy from Baby loves the toys! This excsaucer is perfect my little one! She loves the bird and the balancing animals most! She is just beginning to hold her head up and move her hands for a purpose so she does alot of states and smiles! Great toy and can't wait to watch her grow with it! Love the height adjustment. Rated 2 out of 5 by ts23 from Looks good, but has assembly flaws. Everything went well until mounting the larger toys onto the base unit. I found that the snap fittings meant to keep these toys from being pushed out of the base unit were made too short and could not fit into their respective holes. This resulted in the toys being too loose and not staying firmly in their slots on the base unit. Additionally all of the screw fastenings on the electronic piece were broken allowing the electronics to be exposed. Rated 5 out of 5 by mrahman from Superb and Interactive! We have had the exersaucer for approximately two weeks and my son loves it! The exersaucer keeps him engaged and full of smiles. He enjoyed the wobbling and squeaking effects of the toys. The assembly was easy and sizing was appropriate for my son. I really like the design, color and size of the toys. As an experienced mom who has only used Evenflo products, this exersaucer is lightweight and easy to transport to my parents house. This is a superb and interactive product that will keep a baby's attention! It is a great product for a great price. Love it!!! Rated 5 out of 5 by DesignsARD from So much fun! My 8 month old loves this toy! His face lights up when we put him it in. There are so many great toys for him to play with and he loves to bounce up and down in it too. I love the colors and design of it. It is easy to clean and the colors are not too bright that it stands out in my living room. Everyone in the family is happy with this product.